The intensification of Russian and Syrian airstrikes and military build-up have raised fears of an imminent all-out offensive on the northern province of Idlib — the last major area controlled by rebels. Idlib is the last bastion of the Syrian revolution. Although the province was one of four ‘de-escalation zones’ designated in 2017 through the Astana peace process — a Turkish, Iranian and Russian initiative — these areas have been ‘de-escalation’ zones in name only. One by one, all the zones except Idlib have been retaken by the regime. In picking off the other designated zones, the strategy pursued by Damascus and Moscow was to besiege and bombard, before ‘negotiating’ evacuation deals with the rebels. Many of these rebels — and their families — relocated to Idlib. Currently, around 3 million people reside in the province, of whom 1.8 million are internally displaced. However, HTS is not the only rebel group in the province. The National Liberation Front (NLF) an umbrella group formed by Turkey in May, opposes HTS and commands what is probably the majority of rebels in the province. This group includes jihadis but also more moderate rebels who were previously part of the Free Syrian Army. Further complicating matters is the presence of twelve Turkish military observation posts strung along Idlib’s perimeter. In recent weeks, Syrian regime forces, allied militias and the Russian military have busied themselves in undertaking an extensive military build-up. At least eight Russian vessels, including two missile-carrying submarines, have joined Russian forces stationed off Syria’s coast. On the ground, thousands of Assad-aligned troops have been moving towards the province. Airstrikes are underway and have already led to several civilian deaths. 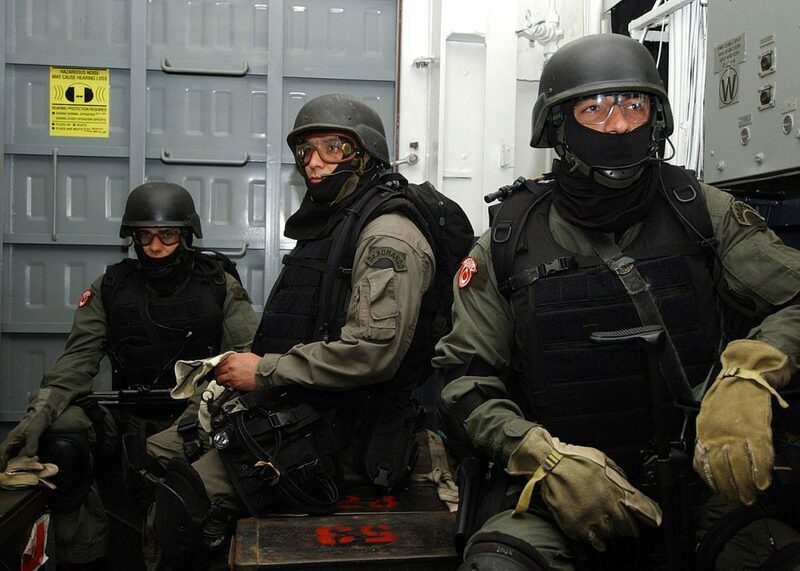 Thus far, diplomatic efforts aimed at resolving the crisis have not borne any fruit. 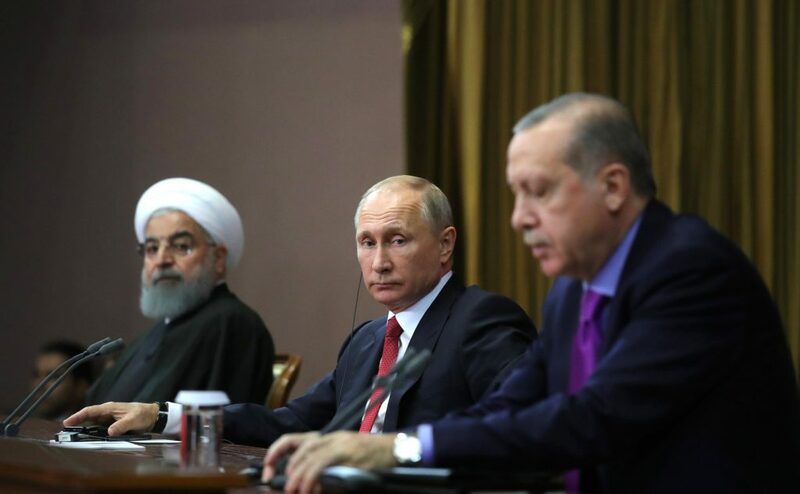 A trilateral summit held in Tehran on September 7 featuring Russia, Turkey and Iran failed to reach an agreement — Turkish calls for a ceasefire were rejected. Ankara sent a clear signal that it has no plans to back down, reinforcing its observation posts with armoured vehicles and special forces. Turkey has deep interests and influence in the mountainous province to its direct south. Together with its observation posts and partial control of the NLF, Turkey maintains channels of communication with the HTS. Retaining a presence in Idlib is important for Ankara: it guarantees Turkey a seat at the table over Syria’s future and provides proximity to the de facto Syrian Kurdish state near Afrin, which Turkey wants to contain and if possible, rollback. Idlib also acts as a type of forward defence for Turkish-occupied areas in northern Syria. Turkey currently hosts around 3.5 million Syrian refugees and desperately wants to avoid another influx, especially given its difficult domestic political and economic situation, highlighted by the ongoing depreciation of the Turkish lira. President Assad’s motives to retake Idlib are obvious. As well as effectively ending the Syrian revolution, Idlib contains the Bab al-Hawa border crossing with Turkey and parts of the vital M4 and M5 highways. These roads link the port city of Latakia to the Deir Az-Zor oil hub, and the capital Damascus to the major northern city of Aleppo. Consequently, Idlib is key to both Syria’s reconstruction efforts and economic future. For its part, Iran supports an offensive to maximise its influence over Syria and ensure it is in the box-seat to gain lucrative reconstruction constructs. But even with Iranian support, the Assad regime lacks the means to take the province alone. Consequently, Russia holds the trump cards — the extent to which Moscow is willing to get involved will decide the viability of any large-scale offensive. On the one hand, Russia wants to recapture Idlib and position itself to reap the benefits of rebuilding Syria. Moscow also wants to degrade HTS and protect its Hmeimim airbase from drone attacks. However, Moscow is wary of getting involved in any quagmire — which Idlib could easily become — that would keep it bogged down in Syria and undercut its stated aims of rehabilitating the country. Moscow is walking a geopolitical tightrope. Due to its isolation from the US and the EU, Russia needs Turkey onside and does not want to risk a confrontation with a NATO member. A massive offensive would also displace hundreds of thousands, with many likely to head to Europe — further aggravating relations with the EU. Chemical weapons increasingly appear to be a part of the regime’s strategy for fighting in densely populated Idlib, meaning that Washington could also be drawn into the fight. US officials have warned against any offensive and the US along with France and the UK are developing plans to initiate a military response in the event that chemical weapons are indeed used. Given the April airstrike carried out in response to the usage of chemical weapons in Douma, and President Trump’s alleged desire to assassinate Assad after seeing footage of the 2017 chemical weapons attacks, this threat will not be taken lightly. Despite the prevalence of breathless media announcements that a full-scale offensive is imminent, an all-out assault is unlikely to ever materialise. 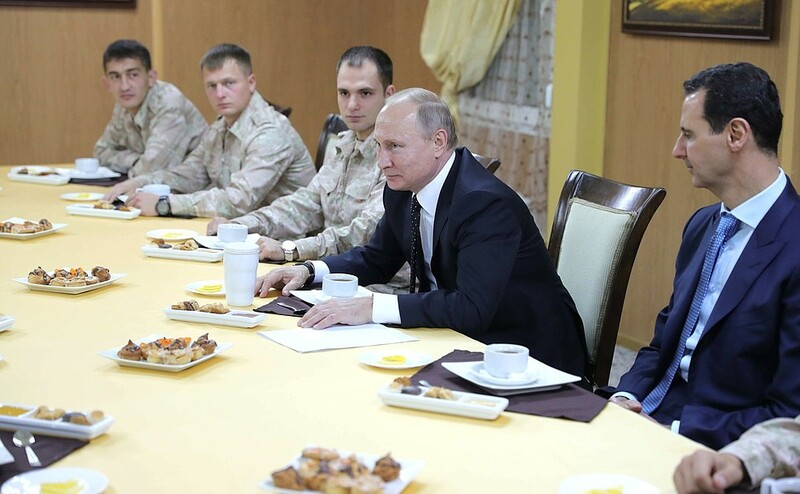 Assad and Iran lack the manpower to take the province alone and the political risks are too high for Russia to fully commit to a sustained campaign in Idlib. Even if the Kremlin lends its support for an all-out assault, the previous fighting strategy is unlikely to be effective, for the simple reason that there is nowhere left for the rebels to be ‘evacuated’ to. In return for maintaining its position in Idlib and preventing a massive refugee influx, Turkey may be willing to accept a limited offensive targeting HTS — which Ankara recently officially listed as a terrorist organisation — while possibly also allow Damascus to retake the M4 and M5. Turkey’s worst fear would be facing a simultaneous regime assault on Idlib and an attack by the Kurdish People’s Protection Units (YPG) on Afrin, a city that Turkey and Turkish-backed forces captured from the Kurds in March. Having proven itself to be an effective fighting force, the level of coordination between the YGP and the regime — as well as Russia’s willingness to fight and the NLF’s cohesion — will all be key factors in determining the extent of Turkey’s concessions. If diplomacy fails, there is a remote chance that a desperate Turkey may launch an assault on HTS itself with the help of the NLF, thereby depriving Damascus and Moscow of a pretext to launch an offensive. Alternatively, a limited strike by Russia and pro-Assad forces could strengthen the Russo-Syrian hand, forcing Turkey to come to the table offering more concessions. It is also even possible that Russia will restrain Assad and that no offensive will take place. With many variables in play, it is exceedingly difficult to predict Idlib’s future. 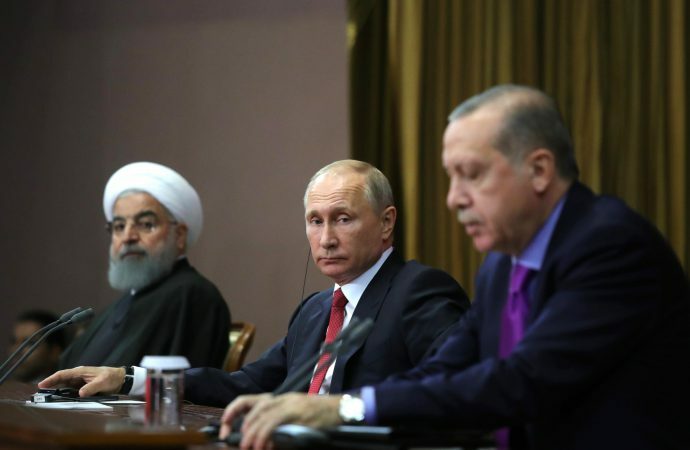 However, the current certainties are that Syria and Iran lack the manpower to launch an all-out assault, and Russia and Turkey have much to lose from any such offensive. Unless those equations change, do not expect a full-scale offensive to be launched anytime soon.